My role as a development officer at DAFWA is extremely varied and changes depending on the time of year. I work across two projects, the Tactical wheat agronomy for the west project and the Management of barley and barley cultivars in Western Australia. The overarching theme of these two projects is to provide growers with the best agronomic information on wheat and barley varieties so that they can make informed decisions on their farms. It’s hoped that by sharing this information, growers will be able to maximize the production and profitability. As a part of these projects I produce variety guide booklets, create webpages, create and update our apps, work with industry groups and speak at field days. I am really enjoying my current role as I get to work in such a varied role. 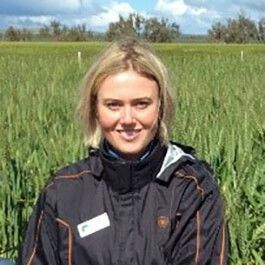 My favourite aspect f the job is speaking at field days and working with other organisations such as GIWA to help share our research with both wheat and barley growers and consultants. I started my journey to reach my current role by completing a Bachelor of Agribusiness (Marketing) through Curtin University at the Muresk Campus. Prior to this role I worked at a variety of Agricultural companies in seasonal roles including the CBH Group and AGT. After university I worked as the Events and Public Relations Coordinator at the Shire of Northam and as a Communications Officer at Wheatbelt NRM.